It wasn't that long ago that fans, and probably Lucasfilm execs, were worried Solo: A Star Wars Story would be a huge disaster. Ron Howard had come in to replace original directors Phil Lord and Chris Miller, and there wasn't a lot of faith the course could be corrected in time. Add to that a motley cast put together (Who was this Ehrenreich fellow?? ), the lowered expectations for a spinoff movie, and it just seemed like a disappointment was very possible. Well, the advance ticket sales should calm a lot of those fears. Fandango's presale tickets to Solo went on sale back on May 4th, and Variety reports that within 24 hours sales had doubled that of Black Panther, one of the biggest movies of the year. Damn. Of course it didn't get a sniff of what Infinity War did, but it's all Disney so what do they care? The second best first day of ticket sales will just have to do. We already know Ehrenreich is signed on for at least three movies, and that makes sense. 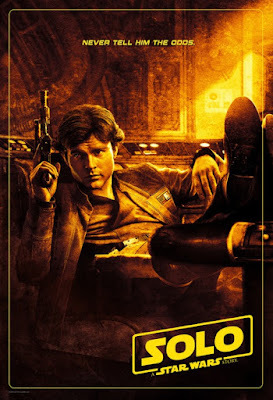 Unlike Rogue One, which already has a sequel called Star Wars: A New Hope, there could be tons of stories told with Han Solo focusing on various stages of his criminal career before joining the rebellion. Heck, maybe tell a story that directly leads up to him being in the Mos Eisley cantina that fateful day. I don't think for a second that Solo will actually beat Black Panther overall, but it certainly isn't going to be a flop like many predicted. We'll find out when the film opens on May 25th.